Katy Doell’s paternal grandfather, Henry Doell, emigrated from Germany through the coastal port of Indianola and San Antonio, Texas. Katherine Mae was born July 9, 1932, to Walter Emil Doell and Willie Mae Hadamek Doell. After performing in rodeos throughout the southern United States and as far north as Indiana and North Carolina, Katy and Lucyle Cowey were guest of the Cuban government and provided entertainment as trick riders for an “expo” in the 1950s. Katy returned to Cuba for a rodeo and Wild West shoe with “fifteen cowboys and cowgirls, on Brahma bull and on jackass,” and then traveled to Kingston, Jamaica. On their way to Panama from Jamaica, one of the plane’s engines shut down and the other began overheating, but they returned safely to Jamaica. Back in the U.S., Katy and her trick-riding horse, Pevo, never took to the air together again. 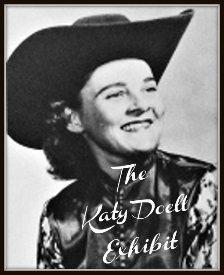 Katy often combined her love for the rodeo and for playing guitar; she recalls opening rodeo events by riding into the middle of the arena with her prized guitar, dismounting from her horse, and playing a western music classic for the crowd. Her band’s first engagement (in 1957) was in Westoff, Texas, at Ms. Emerson’s White Leghorn Inn. Katy periodically drove a taxicab – the first female cab driver in Cuero. She opened the Cuero Music Company at 107 East Main Street in 1975, selling musical instruments, records, and sheet music and later sold antiques in the rear of the store.